Brash, solid, run n gun goofiness thats a tad too underwrought to be truly brilliant. What is it: A surprisingly sophisticated take on run ‘n’ gun platformers, hidden underneath a veneer of grinning action movie homage. Get mission -> kill bad guys -> rescue good guys -> kill big bad guy -> ride helicopter into sunset. This is the action movie archetype, the reason we sit in cinemas summer after summer—a plotline now so mechanical, that Free Lives went ahead and turned it into a mechanic. In fact, this is Broforce’s entire design outlook. It pilfers from action movies, and uses their familiarity to build an immediately readable take on the accepted run ‘n’ gun genre—all pixels, enemy screams and one-shot-one-death twitchery. 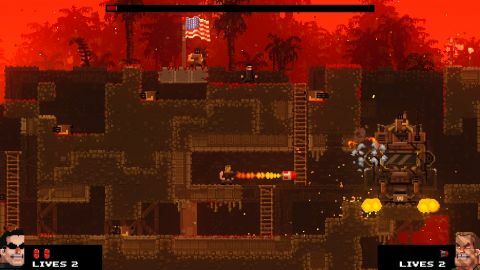 The playable "bros" are Broforce's most obvious references. You play as a line-up of real action stars disguised behind increased muscle mass and names with “Bro” clumsily wedged into them. John Rambro, Mr. Anderbro, Broheart. Every one of the game’s tens of characters is pacey, can climb any surface infinitely, and comes with primary, secondary and melee weapons. But they can play totally differently—the brilliance here being that, if you’re au fait with the action film canon, you’ll have a handle on how they’ll work, even before you’ve used them. When you see Indiana Jones’ secondary weapon ammo is a neat row of bullets, you’ll understand that they’ll kill enemies in a single shot. Robocop’s special move, which superimposes an Apple-1 green targeting matrix across the screen, would be a bit obtuse if we hadn’t all watched Alex Murphy paint his enemies and precision-blast them. There’s no choice in who you play as—you’re randomly assigned a Bro at the beginning of a stage, and rescuing a caged POW (which offers an extra life) randomises you again. It’s a lovely system—making you weigh up the benefits of a good character against staying alive longer but getting a crap one. Everyone wants to be Leon, who can have tiny Natalie Portman snipe swathes of enemies, but no one bar no one wants to be McGyver, who weedily throws big turkeys with TNT stuffing. To add weight to the latter scale, however, the more POWs you rescue, the more Bros you’re able to turn into. It makes Broforce’s characters 1-ups, unlockables, and trivia questions (I was very smug when I unlocked Planet Terror’s Cherry Darling and immediately realised I could use her rifle-leg as a sort violent jetpack) all in one—they’re a delightful centrepiece to the game. A shame, then, that the levels don’t receive quite the same amount of knowing attention. Vietnam-style greenery is reused over and over again, with brief pit stops in far more interesting urban environments and some subterranean tunnel systems. Enemies are reused constantly too—although they at least interact in interesting ways, as when definitely-not-Facehuggers kill AI mooks to become definitely-not-Xenomorphs. It’s neat enough, but fatigue sets in quickly. In a game built on repetition, it could certainly use more superficial change-ups than it has. A love letter to action fantasies, and making the noise of a machine gun with your lips. Presumably, Free Lives didn’t concentrate too much on level design because, most of the time, half of the stage is gone before you’ve stepped on it. Even Indiana Jones’ whip can destroy terrain, meaning you’re more often carving your way under footpaths than using them. Judging by how rarely I got myself fully stuck by just destroying everything, the levels are surprisingly well-designed under the surface, but that can’t stop this system causing trouble in co-op. Co-op is certainly a spectacle—with the right four characters, the entire screen can disappear within seconds of starting a level—but actually playing the game becomes a sterner test. It’s easy to lose track of your character, meaning you won’t notice that you’re collapsing a bridge on all your friends’ heads, ruining the game for everyone. There are so many opportunities to kill your buddies, even without friendly fire, that it often becomes an active struggle not to. Playing alone often makes things more of a satisfying puzzle, but can also make certain boss fights close to impossible, when you repeatedly draw characters who can’t make a dent. But perfection is perhaps not the point. It's a joyful, giggling parody, a love letter to action fantasies, wasted youths and making the noise of a machine gun with your lips. Hell, if we’re happy to watch those endlessly repetitive action movies for so long, why should this be any different?